Digication is an e-Portfolio tool that allows you to creatively organize, showcase, and share your accomplishments online. Here's how to log in to your account and create a new e-Portfolio. Want a quick overview of Digication e-Portfolio? Watch this video. Step 1:Go to https://etown.digication.com in your web browser. Step 2:Enter your Etown network username and password, then click Log In. 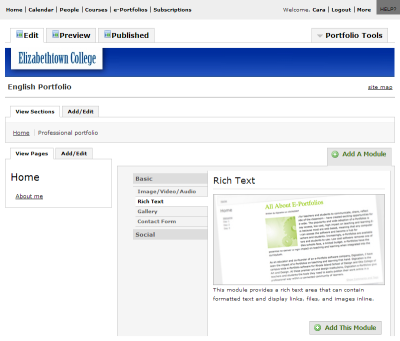 Step 3:Click Create in the My e-Portfolios section. Step 5:Select your template. Click More Templates to see more templates designed for specific courses. Under More Templates, click Elizabethtown College Templates. Choose a template from the list, then click Select. Step 6:Choose your Permissions settings. Click Custom Permissions to grant further access to some individuals or groups. 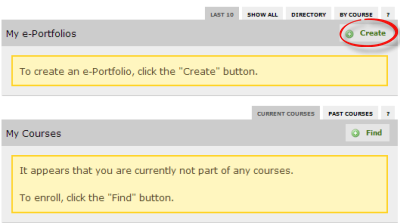 Under Custom Permissions, search for the individual, group, or course to which you want to add permissions. Click on the name when it appears. Next to the name, choose the Role from the dropdown list. Descriptions of the roles are listed under the name. You may click Remove to remove the person/group from your permissions. Note: If you want your portfolio to be private (not searchable by search engines), yet be able to share the link for anyone to view it, choose Public under Permissions. Click Custom Permissions and remove the check from Show e-portfolio in directory. Step 7:Choose your Tagging preferences. Tags are searchable keywords that you can assign to pages to make them easy to navigate. 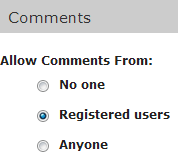 Step 8:Choose who can leave comments on your pages. Note: A registered user is someone that also has an e-Portfolio. Step 9:Choose the comment settings. Step 10:Click Create New e-Portfolio. Step 11:Your portfolio will appear. Here are instructions on navigating and editing your portfolio, and adding content, or modules, to your portfolio.